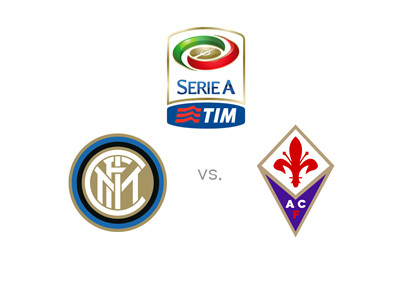 The current number one and number two in Italian football, Inter Milan and Fiorentina, meet in the sixth round of Serie A on Sunday, September 27th, 2015. Inter have won all five of their league games so far, albeit with minimal goal difference. They have scored six goals in total and conceded one. The fans and the club manager Roberto Mancini have to be thrilled about the results as only last year Inter finished eighth, failing to qualify for European competitions. Fiorentina have won four games and lost one so far in the league, scoring seven goals and conceding 3 along the way. The team from Florence finished fourth last season and they are currently competing in the UEFA Europa League where in their first match they lost at home to Basel with the score of 1-2. The most likely scorelines, according to the odds, are a 1-0 victory for the hosts or a 1-1 draw, both valued at 11/2. It looks as the money is on another low scoring, grinding victory for last season's league top goalscorer, Mauro Icardi, and his teammates from Milan. This season of Italian Serie A seems different so far. The four time in a row champions, Juventus, are in the bottom half of the table having only won one game so far. Slightly above them is another powerhouse team, Napoli, who also have won only one game. Napoli and Juve meet on Saturday. Let's see how things play out in the Italian Serie A this weekend.